Here’s another no-bake recipe from Driscoll’s berries. Strawberries filled with a simple cheesecake filling are a bite-sized treat and better-for-you option than, say, a slice of strawberry cheesecake. 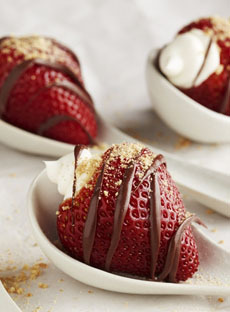 For ease of preparation, make the filling and prep the strawberries ahead of time; then assemble just before serving. Prep time: 20 minutes, cook time is 5 minutes. 1. LINE a baking sheet with waxed paper. Cut the top off each strawberry and core out the center with a melon baller. Place on the baking sheet and set aside. 2. BEAT the cream cheese, yogurt, sugar, vanilla and salt with an electric mixer until creamy and evenly blended. Place the cream cheese mixture in a pastry bag or a self-sealing plastic bag with a corner cut off. Pipe the cream cheese mixture into the strawberries. 3. MELT the chocolate chips in microwave on 50% power or in a bowl set over simmering water. Place the melted chocolate in a pastry bag or a self-sealing plastic bag with a small hole cut in the corner. Pipe the melted chocolate over the strawberries. Chill in the fridge to set, at least 15 minutes. 4. TOP with cookie crumbs and serve on a plate or tray.